Despite the arrival of spring, getting up at 6:00 a.m. to clear the snow from my porch, stairs and walkways is still a fresh and somewhat painful memory. With the help of some blazing innovations, like Powerblanket and WarmTrax portable snow melting mats, I may actually have something to look forward to next winter (but as of now, I’m certainly not rushing it). 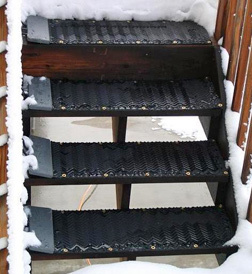 WarmTrax snow melting mats and stair treads are an inexpensive alternative to shoveling, snow blowing, salt and embedded systems, and require no formal installation. They’re designed to lie on top of existing surfaces to continuously melt snow and ice. Just roll them out over sidewalks, ramps, walkways, your front porch, even your stairs, enough to keep your mail carrier happy through the winter months. 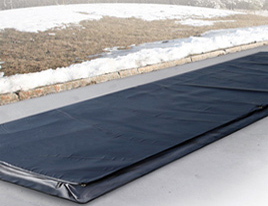 WarmTrax snow melting mats are incredibly durable. An electrically operated heating element is sandwiched between two protective non-slip rubber surfaces that are designed to endure harsh conditions and provide excellent traction, while enduring repeated foot traffic. To get instant heat, just plug them into any standard 120V or 240V outlet after placing them over the surface you wish to heat. PowerBlanket concrete curing and ground thawing blanket. Powerblankets, another portable, extremely efficient portable heating solution, can also be used in the harsher months as curing blankets, for ground thaw or to warm barrels or engines. Made from rugged, non-flammable material, Powerblankets are durable enough to meet the demands of large construction projects or heat stalls, kennels and common areas where animals congregate during the winter months. On construction projects, Powerblankets are often used to accelerate concrete curing or as a ground thaw and heating source for working areas, or to protect materials and heavy equipment. They are available in a wide variety of sizes and shapes to accommodate jobs, large and small (very smart indeed, for those of us whose jobs take us outside during the harsh winter months). Both of these products are low voltage, durable and incredibly safe, even wet. It doesn’t take a construction professional to appreciate the power of WarmTrax and PowerBlanket products. Knowing that I have a portable snow melting solution at my finger tips provides me with a security blanket of my own. Mother Nature can unleash a barrage of white stuff during winter’s coldest months, but I only have to throw down the heating mat and plug it in to create a safe, ice-free walkway. Not to mention that rolling out my portable snow melting mat during a snowstorm is like rolling out the red carpet as far as my mail carrier is concerned.